Bohemian beach cooking at Rhenia. Rates starting at €180+VAT (includes all groceries and cooking equipment). Innovative cooking concepts reflecting Mediterranean influences. Rhenia is an inhabitant island next to Delos island, which is protected by Unesco World Heritage as its archaeological site is exceptionally extensive, rich and conveys the image of a great cosmopolitan Mediterranean port. Rhenia is famous for its crystal clear waters, ancient temple ruins and high energy levels. It is a unique natural paradise, worth seeing while you visit Mykonos. 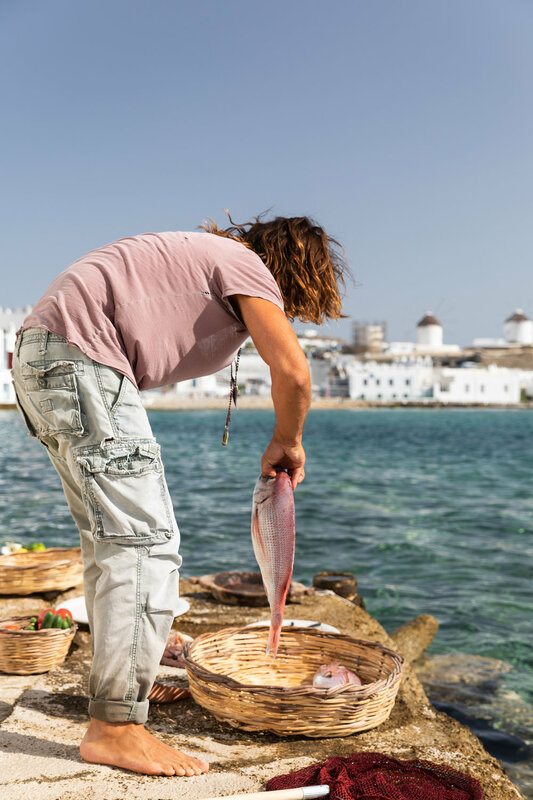 Our team of professional chefs will take you by boat from Mykonos, to the famous Rhenia island and create an unforgettable, live and authentic Greek cooking experience for you. Explore the beach, swim, sunbathe and enjoy the delicious live cooked recipes. Per week and/or per day on request (calculated on number of guests and menu selection on agreement with the head chef). Healthy breakfast and brunch preparations in the villa, with ingredients from the chefs private farm in Mykonos. Or if you prefer ready made breakfast baskets per person on delivery to the villa. Wake up to your customised healthy breakfast to begin your day; with fresh juices, yogurt with homemade (strawberry, orange, blueberry, peach) jam or honey with cinnamon and granola. Also Homemade Pasta ( tagliatelle, ravioli, macaroni). Watch the chef and his team prepare the pasta and cook it live for you! Seafood recipes reflecting Mediterranean influences. All fish, oysters, shrimps, lobsters are caught in the morning by our local fishermen. Loooove the food! It's just fantastic! I love everything about the Bohemian beach experience!